Hannes Egger re-negotiated the concept of plastic art and how it interacts with its audience, mounting a custom-made sculpture park along the boulevard known as Marzahner Promenade: the Skulpturenpark M.
Among the objects displayed are Michelangelo‘s „David“, Alberto Giacometti‘s „L’Homme qui marche I“ (The Striding Man I), Myron‘s „Discobolus“ and Auguste Rodin‘s „The Age of Bronze“, to name but a few – in other words, more than 20 outstanding sculptures that have had a deep impact on the history of art. And yet, the objects of Skulpturenpark M are not made from marble, bronze or concrete but rather from an intangible material: They consist of instructions which encourage passers-by to stop, strike the pose adopted by the original sculpture and turn into a work of art for a short moment. That way, Skulpturenpark M is reinvented and created anew over and over again – and each time only through participation. Designed to be a living, animated context, it is in fact a sculpture park for the entire borough of Marzahn-Hellersdorf, its inhabitants and its guests: It is up to them to take centre stage and make the installation come alive. 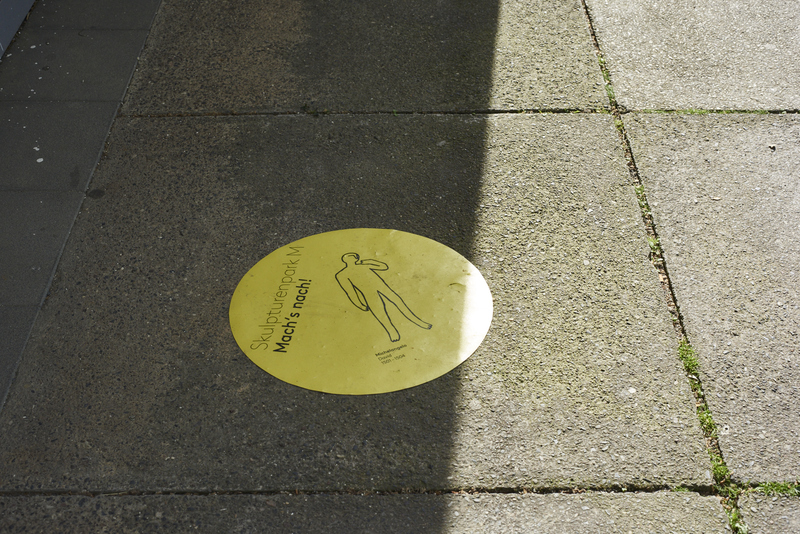 In terms of material and space, the sculpture park takes a back seat: Limited to illustrations and instructions drawn on the floor, it leaves plenty of room for people to move into the focus point. Not the sculpture is at the centre but the person re-enacting it.